The Miami Dolphins put together their best season in 2013 since the 2008 season. However after a 3-0 start, they finished 8-8 and failed to make the playoffs for the 5th straight season. Miami didn't really play well on either side of the ball despite finishing .500. They ranked 26th in total offense and 21st in total defense. The future is bright for the Dolphins though, as quarterback Ryan Tannehill had a much improved sophomore season and their 23 year old running back Lamar Miller has shown promise. The team did bring in Knowshon Moreno who rushed for over 1,000 yards and 10 touchdowns with the Broncos last season, which should also help the teams run game. Mike Wallace had a pretty disappointing first year with the Dolphins, but should fit in better with the offense moving forward. Also, the team used their first 3 picks on offensive players. Their 1st and 3rd round picks were offensive tackles, Ja'Wuan Janes and Billy Turner, which should help what was a disastrous O-Line last season, and Jarvis Landry with their 2nd round pick which will provide depth at the WR position, something they did not have last season. Despite not having a good offensive line, or a number of quality options on offense, Ryan Tannehill still have a good season and showed much improvement over his rookie season. After a 12 touchdown, 13 interception rookie season, Tannehill bounced back last year with a 24 touchdown, 17 interception year. He also threw for 3,913 yards. With an improved offensive line and two quality running backs, things should only get easier for the Dolphins QB. Tannehill has great chemistry with Brian Hartline and tight end Charles Clay but things did not really click with Mike Wallace, who the team signed last year. However with a year under their belt together, they should should be connecting on some big plays in 2014. Also, the team drafted Jarvis Landry who will be another playmaker for Tannehill to work with. We ranked him 19th in our QB rankings. The Dolphins brought in free agent Knowshon Moreno this offseason. Moreno had a monster season playing with Peyton Manning and the Denver Broncos last season. Moreno rushed for over 1,000 yards and scored 10 touchdowns. He also is valuable in the passing game as he caught 60 passes for 548 yards and 3 touchdowns last year. Moreno was the main running back for Denver last year, and helped the the Broncos reach the Super Bowl, so I think it's safe for the Dolphins to let him lead the rushing attack and help Lamar Miller grow as a player. We ranked him 29th in our RB rankings. ** Just a side note, do not expect Moreno to put up similar numbers in 2014. He will not be playing on an uptempo offense or playing in an offense run by Peyton Manning. Splitting time with Miller, you can expect maybe 750 yards and 5 touchdowns. Lamar Miller is heading into his third NFL season and had a decent sophomore season. He had 177 carries for 709 yards and scored twice. Miller split time with Daniel Thomas last year and will once again be splitting carries this season. If Moreno proves that last year was no fluke, then Miller might see extended time on the sidelines. However if Moreno can't get things going in Miami, then Miller will have every chance to become a workhorse for Miami. We did not rank him in our RB rankings. As I said before, Mike Wallace had a disappointing first season with the Miami Dolphins. The chemistry between Wallace and Tannehill was just not there last season. In 2010 with Pittsburgh Wallace caught 60 balls on 100 targets for 1,257 yards and 10 touchdowns, in 2011 he caught 72 balls on 113 targets for 1,193 and 8 touchdowns, in 2012 he caught 64 balls on 119 targets for 836 yards and 8 touchdowns. All three of those seasons were under Ben Roethlisberger. Last year under Tannehill, Wallace caught 73 balls on 142 targets for 930 yards and just 5 touchdowns. So clearly Tannehill tried getting Wallace the ball, they just failed to connect. Expect things to improve in 2014, as Wallace should top the 1,000 yard mark and score around 8 touchdowns, as he should make some big plays. We ranked him 31st in our WR rankings. This guy is an unbelievably valuable fantasy player in PPR leagues. The past 2 seasons, Hartline has caught 74 and 76 passes, and reached the 1,000 mark, barely (1,083 & 1,016). Unfortunately he is not a red zone weapon and that's where he hurts you in fantasy. Despite the 150 catches over the past 2 seasons, Hartline has only scored 5 times. For his career he only has scored 10 times on 259 receptions. If you play PPR leagues then Hartline is worth a look, but if touchdowns are key to win your league then you may want to look elsewhere. We did not rank him in our WR rankings. In 2011 & 2012 Charles Clay caught 5 combined touchdowns for the Dolphins on 34 receptions. He was considered an afterthought on this Miami team. However last season he was one of the nice surprises in the NFL. 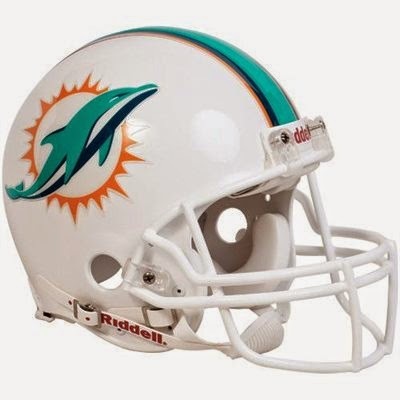 The Dolphins had planned on Dustin Keller being the starting tight end and being a playmaker in the offense, but he went down with an awful knee injury and Clay had to step in. Clay had a very good season as he caught 69 passes for 759 yards and 6 touchdowns. Clay will get another season to impress fantasy owners. We ranked him 10th in our TE rankings.